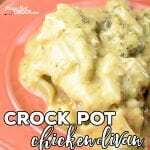 Are you looking for a way to switch up your regular crock pot chicken recipes? This Crock Pot Chicken Divan brings an easy flavorful twist to family dinner. Place your chicken and broccoli in the bottom of a 4-6 quart slow cooker. In a medium bowl mix together soup, mayo, curry powder(*SEE NOTE) and stock. Cook on low for 6-8 hours. (If using tenders or if your slow cooker cooks hot, your dish could be done in as little as 4-5 hours). Sarah recommends that you use 1 teaspoon of curry at first and taste to make sure it is not too spicy before adding anymore. My family enjoyed 2 teaspoons but I could see some families that love spicy foods wanting to add even a little more. Sarah recommends serving this over rice, mashed potatoes or pasta. We loved it all on its own as well. This recipe will cook up nice in any 4-6 quart slow cooker, however, it is also a great recipe for the Casserole Crock. If you don't like canned cream soups, you could always use our homemade versions.